You want to rescue a dog - give a home to a poor neglected beastie who’s had a bad start in life? Good for you! There are so many stories of spectacularly successful adoptions, where the dog fitted easily into her new home from Day 1, had few issues and was easy to train. But this isn’t by any means always the way it goes. So you need to go into this with your eyes open. Do not allow sentiment to cloud your judgment! Most dogs up for rehoming (unless they’re very young puppies) come with baggage - of some sort or another. We all have baggage - life experiences that have formed our worldview - some good, some not so good. And not every dog is the perfect match for your life. Some will have been neglected; some will have been abused; some have lost an adoring owner through death or other catastrophe; some were just not given the right care. But they all have a history, good or bad. Same as you would, if suddenly transported to a new home where people do things differently. There’s scope for a lot of misunderstanding and confusion here - even which way you hold your knife and fork, or how to make coffee! So imagine how hard it can be for a dog to adapt to such a major change in his life. Sometimes the dog settles into his new home seamlessly and easily, but sometimes this baggage takes a lot of work, some expense, and much dedication, to unpack. Love alone is not enough. Any reputable rehoming shelter will tell you the truth about your chosen pet. But sometimes they don’t know the truth themselves! If the dog was found straying there is no history attached. And a dog in even the best and kindest rescue centre can be completely shut down and depressed - or continually hyper and mad. Neither of these states will reveal the true dog. 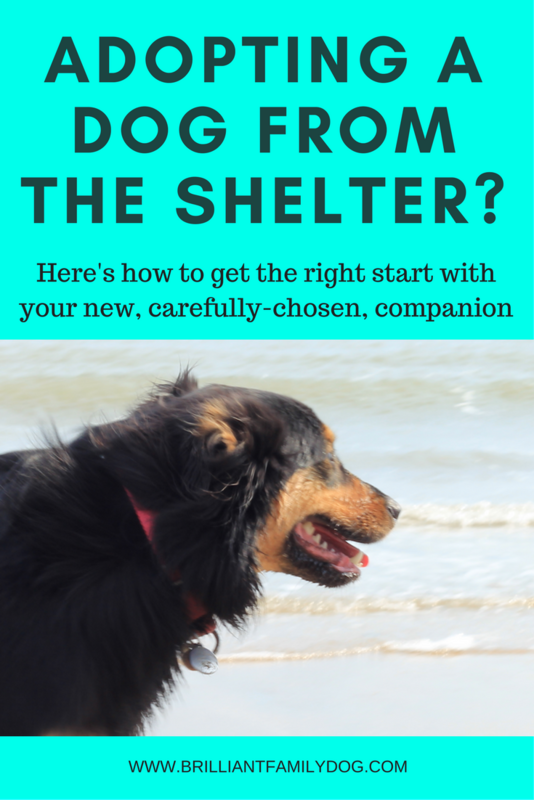 Only once your new dog has been in your home for as long as two or three months will you know what he’s really like, and what issues he may have. If I moved into your house, for example, at first I’d be saying “Is it alright if I sit here?” and “Where does this cup go?”. After a couple of months I’d be feeling at home and sitting where I liked and leaving cups any-old-where! This is when you’d see the natural me. So it is with your new dog! That's a fairly common question. My answer? By the way, not all shelters are created equal. If you arrive at a place and it’s noisy, the dogs are all racing about their pens barking, showing repetitive behaviours like circling or jumping off the wall, and some dogs are lying deathly still and have completely opted out, then you will struggle to see what your selected dog is actually like in reality. Stress has taken over and made the original dog unrecognisable. It can take many weeks for this dog to unwind. Think of those poor children in camps in war-torn countries: we would absolutely expect them to have substantial damage which would take many, many years to repair. Why do we assume a dog will just be fixed in an instant? There are shelters with enlightened policies of taking in fewer dogs (though successfully rehoming more! ), giving all dogs more space and distance, keeping things calm and quiet, not allowing public access to all the dogs - only the ones they select to offer a particular family. Keep in mind that if this dog were no trouble he may not have been abandoned by his owners. That’s not exonerating those owners - they should have thought before even getting a dog in the first place. Giving up on an animal through their own neglect and idleness is utterly wrong, and unfair. He may have developed habits through lack of adequate care or training, that caused his first owners to get rid of him. • Maybe he’d developed a habit of running off, because he was never taught a recall. Love and nurturing will do a lot of healing, of course. But to deal with any difficult issues - such as inability to cope with the presence of other dogs on the planet without lunging, barking, or screaming, threatening to bite if approached, stealing and guarding stolen items ferociously - you need professional help. There’s no need to struggle on for months while the situation gets worse and worse and you regret your decision to get your dog! Get the help you need straight away. Once you understand why your dog is acting as he is, changing it becomes straightforward. Finding a true force-free trainer is essential. Any aversive or coercive methods (shouting, throwing things, yanking the lead etc) will only compound the situation and make it far worse in the long run. You’ll find a list of useful organisations at the foot of this previous article. There are plenty of rehomed dogs who have turned into Brilliant Family Dogs! This may be by luck or by judgment, but is a great outcome. In my line of work I naturally tend to meet a lot of the rehomes that cause problems. And I’m happy to be able to say that the situation can always be vastly improved. It’s a joy to see the dedication of the new owners as they work to rebuild their new dog’s shattered confidence. Cast off the rose-tinted spectacles! Matching a dog to your family is a delicate and difficult task. Be sure to remove your rose-tinted glasses before you make any decision. You and your family will be living with this dog for anything up to the next 15 years or so. The placement must be right for you and your dog, but also your children and your spouse too, not to mention your cat. While you’re still looking for your perfect companion, do a bit of research into what you’ll need. Here’s your Action Step: While you can’t purchase a crate until you know your new dog’s size, you can certainly do your homework and narrow down the choice so you’re ready to get one as soon as you expect your dog to arrive with you. Don’t cut corners - go for the best and most robust that fits your budget. This crate is not for confining your dog to keep him under control - it’s to give him a safe haven where he gets all his meals and toys, which he’ll love, and which will help enormously with separation - both night-time and daytime absences. And don’t forget the essential training! You can’t expect your new dog - who may be very confused about what people want of him - to just know what you want. You have to teach him, step by step. And while some of those steps may feel uphill, most will be successful - if you follow a force-free training program. There are some excellent dog training classes around the world where the instructor is firmly grounded in force-free training, treating each animal as an individual (refer to that list above for umbrella organisations). They follow the same style of teaching as my books, which have received over 150 5-star reviews from pet-owners, who enjoy their directness, simplicity, and effectiveness (and humour!). You may have a challenging new dog - but with a little help and support you can turn him into your perfect pet. Happy hunting for your new companion, and may you be one of the great rehoming success stories! If your new dog is struggling to adapt to life in our world, join our free 5 Day Video Mini-course. You'll learn new skills that will help with any dog!